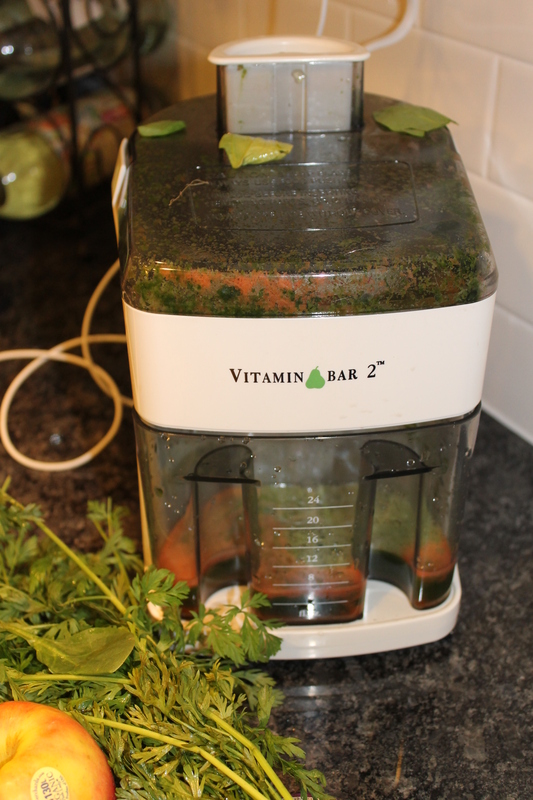 If you’re anything like me you are wondering what all this juicing buzz is about. It seems like the latest and gratest attraction when it comes to losing weight, right? Wrong. Despite what you think, juicing is not at all a new thing and should not be considered a meal replacement, but rather an additional way to consume vitamins and minerals that we are lacking in our diet. I can remember when I was growing up that my mom would juice vegetables/fruits and I would just think she was crazy for drinking a yucky green drink- and now I am actually excited to dive in and spike my drink (not with vodka) but with kale, spinach and loads of other vitamins. Who knew? 🙂 Many of us consume a lot of calories with little nutritional value- this can help change that. 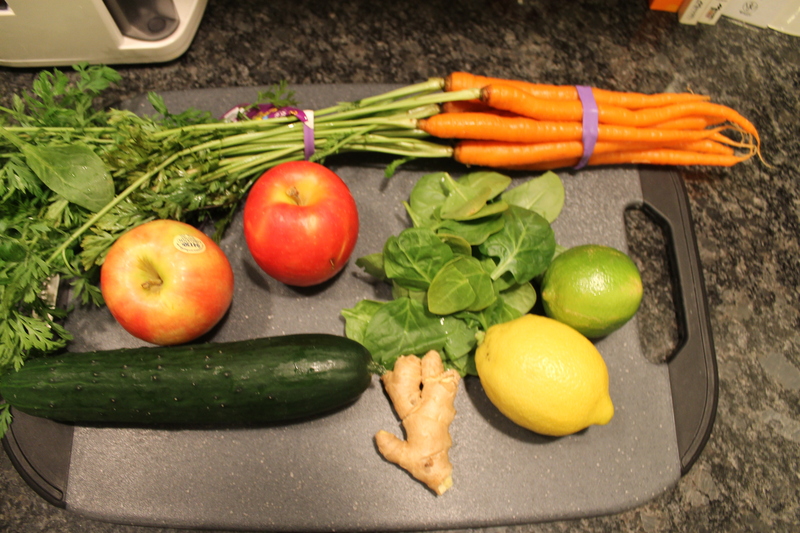 I made my first drink last night (pictured above) and it had spinach, cucumber, lemon, carrot, and a red apple. NO LIE, it was soo good I forgot to take a picture before I drank most of it…oops! (The glass was full.) On a side note, I have no idea where this juicer was purchased or what year for that matter. I posted a link to newer ones below. Here’s a little Juicing 101. We can consume far more vegetables and fruits through juicing than the time it takes to properly chew and digest in a days time. Also, if we actually ate vegetables there would be no need to juice, but we don’t. This allows a variety of foods you wouldn’t eat to be disguised while still recieving the benefits. 2? We can juice parts of the plants we wouldn’t normally eat such as stems, leaves and seeds. 3. Juice is broken down so it spares your digestion. The estimated time juice is put to work in the system is about 20 minutes after consumption. If your digestive tract is off- you will know by your transit time. Juicing will definitely aid in speeding this process up. 4. When we have ailments, juice is therapy for this reason. When the body has to work hard to break down veggies- it can spend alot of time on the digestive process. Juicing does the work for you. When you drink fresh juice, all the nutritents can go to work right away and heal your body to then disperse energy for rejuvination. 5. How long can juice be stored? Ideally, you want to consume juice right after it is made. If this is not possible for the sake of time, it must be kept in an air tight jar or container and consumed no longer than 24 hours after. Say the juice turns brown- Don’t drink it. It has become oxidized and most of the nutrients has been depleted. 6. Will juicing cost a lot of $$$? No. The cost of a glassof juice is less than a latte. $2-3.50 depending on the time of year and where you purchase. JUICING IS DIFFERENT THAN A GREEN SMOOTHIE. 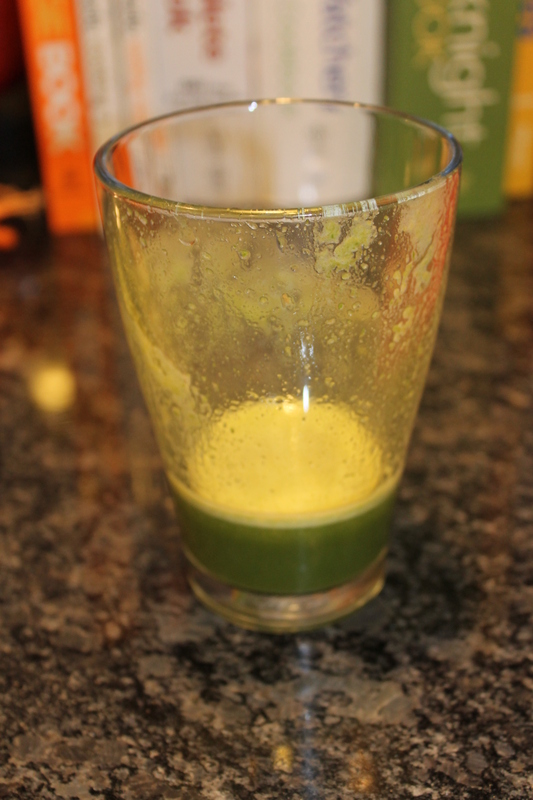 Vegetable juice is all you drink when juicing. In a smoothie, the whole vegetable/fruit is consumed. Both are ways to consume raw (uncooked foods) that are at their highest nutritional value. Fruits, berries, root vegetables, vegetables, green leaves, nuts, seeds (both unsalted/processed), dried fruits, cold pressed oils, honey, seaweed, sprouts, and superfoods such as spirulina, chia seeds, flax etc. 1. WASH all produce before juicing. 2. Always peel orange, tangerines, tangelos, grapefruit before juicing (contain oils that can cause stomachaches). 3. Remove pits, stones, hard seeds from fruits such as plums, apricots, cherries, mangoes, apples, grapes etc. 4. Stems and leaves of most produce can be juiced. 5. Cut fruits and veggies into sections or chunks to fit in juicer. 6. 80/20 Rule. A juicing diet should consist of the 80/20 rule. This rule means 80% Alkalizing food and 20% Acidifying food. A normal pH should be between 7.35-7.45. A pH level below 7.0 indicates an acidic forming diet and above 7.0 is Alkaline. You can find a list of Acid/Alkalizing foods here. 6. Choose a good juicer. While this is an investment for your health, I don’t think you need to spend hundreds of dollars on a juicer- but don’t be cheap either. In between priced should be suitable. Here are some to check out on Amazon. 7. Juicing should NOT BE considered a meal replacement but rather an addition to the day. Remember, ADD, ADD, ADD to your diet. 8. You don’t need to have a specific recipe when juicing. Take a chance and experiment because what I like might not be what you like…Good luck! Disclaimer: I am not a doctor and do not recommend stopping any medication w/o consultation from your doctor.